Slanted Back Permits Better Views of Information. Plastic Construction is Durable for Retail Settings. 1.5" Deep Lip Will Hold Frames, Periodicals, & Pamphlets. 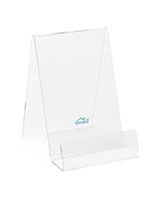 This acrylic magazine holder for tables has a top fold for an easel-like design that will hold leaflets, catalogs, or wall-mounted frames. 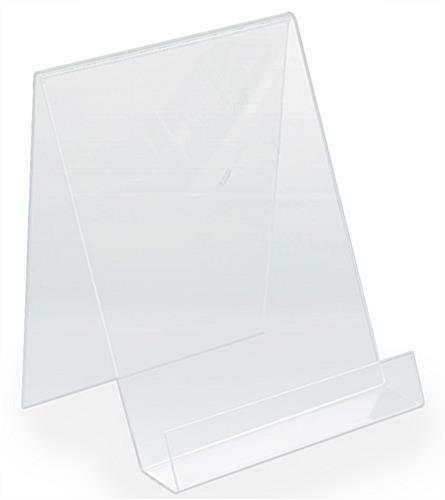 The plastic literature display has a lip that is 1.5” deep to hold many copies of brochures. The magazine holder for countertops is ideally placed in the sightline of customers or patrons to further advertise your businesses or important information. The leaflet easel is able to present 8.5” x 11” flyers easily and the open access makes them easy to grab. The holder is clear plastic so as not to detract from whatever information is on display. The countertop literature display is able to blend into any setting because of it transparent construction and will withstand even rough retail placement.